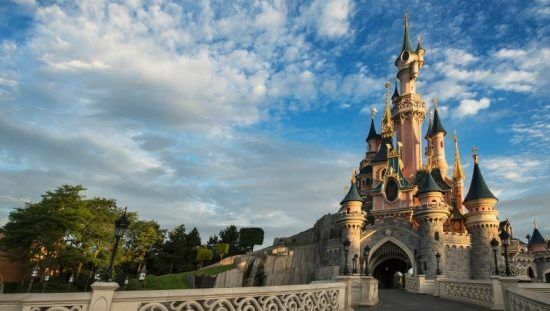 There are currently three different styles of castles which stand as icons to Disneyland (plus the Magic Kingdom in Florida) parks around the world. Restaurants, shops, displays, and even attractions call the various fairy-tale buildings home. These testaments to dreams and magic each have their own special features depending on which park they are found within. Join Inside the Magic as we take a tour around the world and compare the castles (in our 2 part series) which grace the theme parks of the Walt Disney Company. 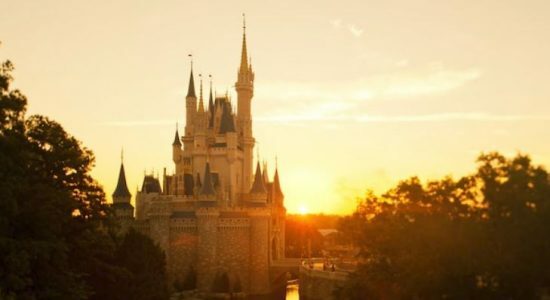 There are three theme parks that lay claim to the original castle style that Walt used as a centerpiece of the very first theme park in the 1950s. Sleeping Beauty’s castle was inspired by Germany’s Neuschwanstein Castle. The original castle that opened with Disneyland in 1955 still stands as the icon to the theme park as well as the gateway to Fantasyland. Within the castle is a series of three-dimensional animated scenes depicting the story of the castle’s namesake, Sleeping Beauty. The story culminates with an ominous transformation; Maleficent transforms into a fire breathing dragon. The castle is only 77 feet tall, but may seem larger thanks to the use of forced perspective construction at the upper levels. 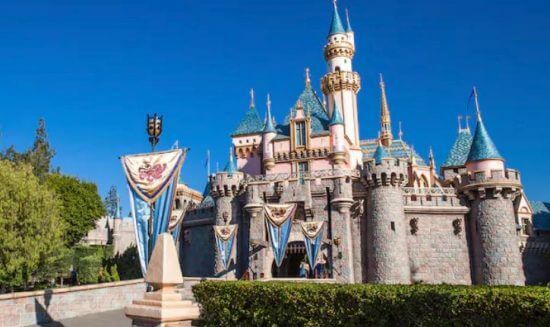 Practically an exact copy of the castle in Anaheim, Sleeping Beauty’s Castle closed forever on January 1, 2018. The building is currently undergoing a major $1.4 billion renovation. 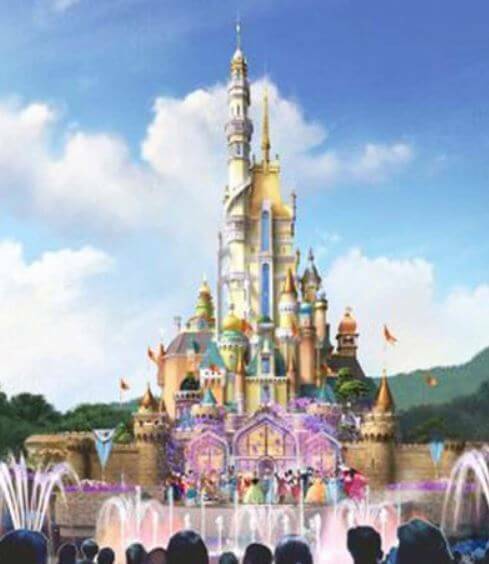 When the new structure opens in 2020 for the park’s 15th anniversary, it will tout taller towers and feature scenes from several Disney princess experiences (the rose from “Beauty and the Beast,” a poison apple from “Snow White,” and Cinderella’s grand carriage). Euro Disney, or Disneyland Paris as it is now called, opened with a rather unique version of Sleeping Beauty’s castle. This 167 foot tall structure opened in 1992. This particular incarnation of Sleeping Beauty’s Castles offers guests the opportunity to roam the castle and surrounding grounds. Upon doing so, Sleeping Beauty’s story, or “Belle au Bois Dormant,” as she is called in France, can be witnessed – as told in a series of scenes, depicted in stained glass and tapestries. These scenes, along with access to castle parapets overlooking Fantasyland, are found on the second floor of the castle. Meanwhile on the ground level, and below, those brave enough to enter the “Taniere du Dragon,” will find themselves face to face with an awakened dragon who roars and breaths smoke. This gothic revival style structure was the second such castle to be built for a Disney theme park, the Magic Kingdom in Walt Disney World, Florida. Inspired by both the animated castle of its namesake and real world wonders like Fontainebleau and Versailles castles, this taller structure is “guarded” by a series of gargoyles around its spires. 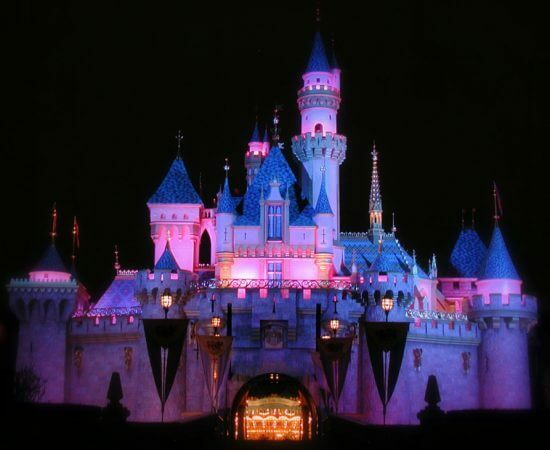 As with the Haunted Mansion, Cinderella’s castle is replicated at Disneyland Tokyo, though a bit shorter. Home to a Bibbidi Bobbidi Boutique and Cinderella’s Royal Table, this 27 tower icon also houses a special hotel suite. 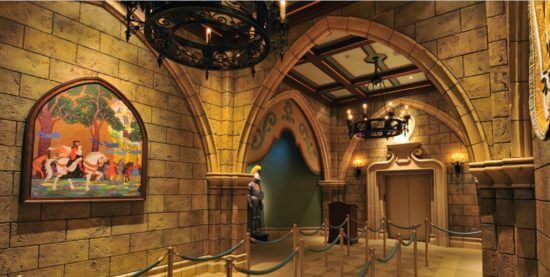 The room was originally intended to be used by the Disney family. A walk through the center of the castle takes guests past a beautiful mosaic tile depiction of Cinderella’s story. The 189 foot tall Cinderella’s castle opened in 1971. 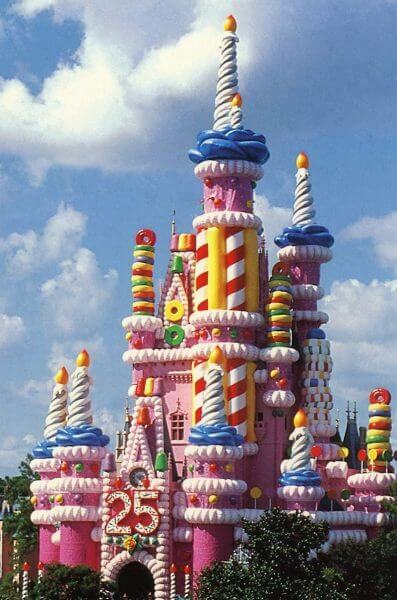 For a brief time ,the castle became a birthday cake make over for the park’s 25th anniversary. The only other castle to have Cinderella’s name is found in Japan. Disney’s third theme park, the first outside of the United States of America, bears much resemblance to the Magic Kingdom in Florida. Tokyo Disneyland opened in 1983. Within the walls of this 168 foot tall wonder is an eight minute walk through attraction. Cinderella’s Fairytale Hall is an open invitation from Cinderella and Prince Charming. Guests are encouraged to explore the various works of art telling the couple’s story. There’s a throne, perfect for photo ops as is a glass slipper. Evolving from a mere iconic centerpiece to a center of experiences, a new approach has emerged in the Disney theme parks. This revival kicked off in 2016, when Shanghai Disneyland opened and continues with the renovations taking place in Hong Kong Disneyland. These new castles, instead of focusing on one princess now include them all! 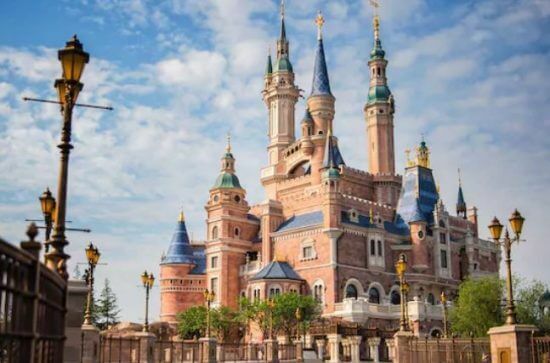 The newest and perhaps most amazing magical castle is found at Disney’s newest theme park, Shanghai Disneyland. 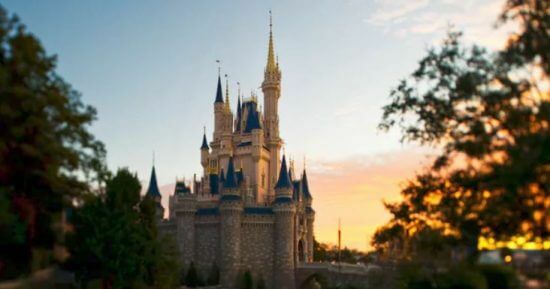 It is home to largest of all the Disney castles known as “Enchanted Storybook Castle.” This massive structure includes dining in the Royal Banquet Hall, a Bibbidi Bobbidi Boutique, two attractions, live shows, and is home to all of the Disney Princesses, ready for meet and greets. “Magnificent mosaics depict all 4 seasons through the tales of Tiana, Merida, Rapunzel, Elsa and Anna. An illuminated marquee reveals motifs attributed to Belle, Cinderella and Snow White. From golden spires adorned with auspicious symbols to a Renaissance-style entrance that defines grandeur, Disney magic is infused in every architectural detail— even the castle walls exude an air of regalia! Voyage to the Crystal Grotto (entrance in Fantasyland) features scenes from several Disney stories (“Beauty and the Beast,” “Aladdin,” “Mulan,” “The Little Mermaid,” “Fantasia-The Sorcerer’s Apprentice,” and “Tangled”). 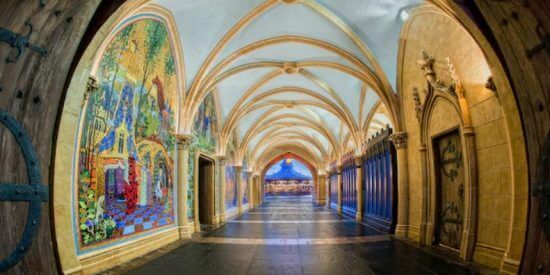 While it does not depart from the Storybook Castle, the boat ride does travel underneath the castle as a montage of all the stories comes to life in crystal like art along the walls. 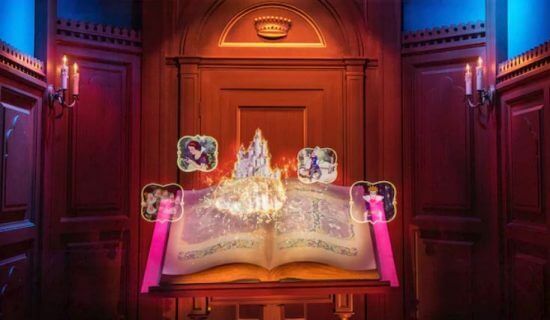 The “Once Upon a Time” Adventure allows guests to walk through the castle and come face to face with the Magic Mirror. Once they step through the mirror, Snow White’s tale unfolds in a series of brilliant videos blended with matching surroundings. The enchantment found in these six theme parks, each with their own fairy tale focal point, is an example of imagineering evolution. 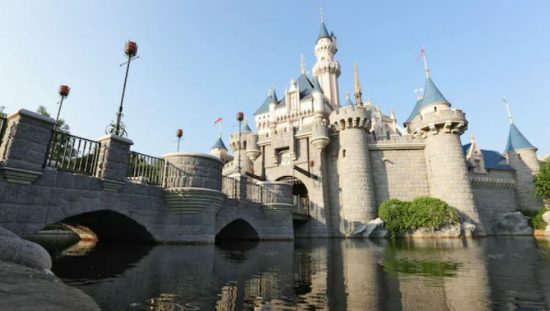 From the first Sleeping Beauty Castle in Anaheim, California, to the modern marvel found at the center of Shanghai Disneyland, Disney’s princesses have a host of homes to choose from. Do you have a favorite Disney castle? Please share your fairy tale in the comments below. How much are your vintage Disney VHS tapes really worth?